Sony's business activities affect the environment in various ways. This overview looks at Sony's environmental footprint from the perspective of product life cycles. The chart below shows Sony's impact on the environment over the entire life cycle of its business activities, including energy and resources used in business activities, energy consumed by Sony products when used by customers, and the recycling and disposal of products after use. The chart shows the principal environmental impact during fiscal 2017 for items that Sony can recognize and manage directly. The recent escalation of climate change issues has prompted corporations to broaden the scope of efforts to ascertain the greenhouse gas emissions not just of their own operations but also those throughout their entire value chain. *1 Sony has determined emissions from its major component suppliers and manufacturing contractors. 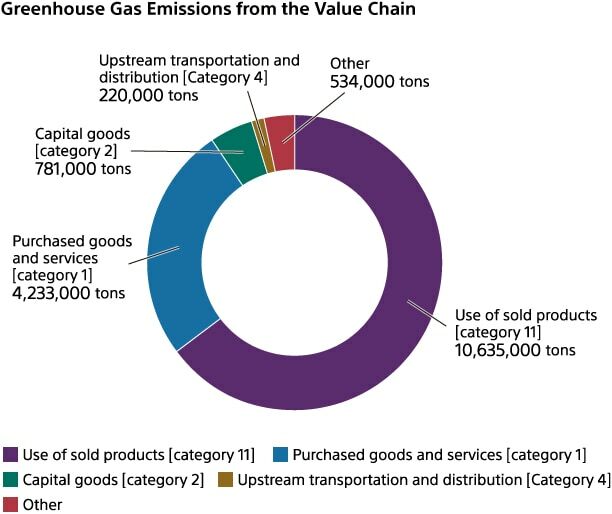 Furthermore, based on the level of emissions identified, Sony has estimated greenhouse gas emissions for its entire value chain. *2 The amount of greenhouse gas emissions from Sony's overall value chain in fiscal 2017 is estimated to be approximately 16.92 million tons. The largest volume of emissions, approximately 10.67 million tons, was from "energy consumed during product use." The next-largest category was "goods and services procured," which includes raw materials and components, at approximately 4.66 million tons. Sony plans to build its own system for identifying greenhouse gas emissions over the entire value chain and will work to enhance the accuracy of the system and strengthen management of emissions. *1Value chain refers to the entire product life cycle process, from procurement of materials through to manufacturing, use and disposal. It includes upstream and downstream manufacturing processes. *2Estimated greenhouse gas emissions are calculated in accordance with the Greenhouse Gas Protocol's scope 3 accounting and reporting standard and guidelines published by Japan's Ministry of the Environment. For more information, please refer to "Environmental Data."